One of the dreams I had over the last year was purchasing my dream car. I have it now and have been loving it. 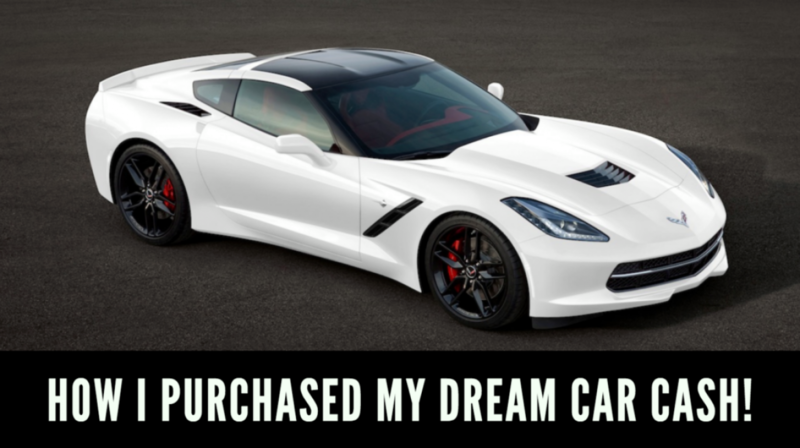 And now I want to break down for you exactly how I made acquiring my dream car a reality. Dreams come in all flavors, and they are different for every individual. Maybe you want to live in your dream house or drive your dream car. Maybe taking your spouse on an exotic vacation is your dream. Perhaps you have in mind a certain amount of money in your bank account—and that’s your dream. Is having a beach body what you dream about? Or maybe you’re a college student—a modern millennial—and you’ve got a dream report card. As for me, I am in a new 2018 Corvette Stingray. I’ve had people come up to me and say, “Wow, Steve, that was so spontaneous. All of a sudden you bought a Corvette in cash.” And I did—took out $52,000 and just paid cash. But it wasn’t exactly out of the blue. Whatever your personal dream is—a material possession, an experience, or some other goal—I will let you know the formula of how to accomplish it. You need to see your vision in your mind before you can get it. This may seem like a no- brainer step, but many people neglect it. You will never in a million years accomplish a dream if you don’t know what it looks like. To begin, you don’t have to know exactly how you are going to accomplish it, but you must have that vision. About a year ago, I started developing this vision in my mind of owning my dream car— a Corvette Stingray. I looked at pictures. I looked at Corvette advertisement. I perused Corvette forums online. I was starting to envision exactly what I wanted. The car was white. It had the black rims. And red seats—I wanted the red seats. I envisioned the car’s every detail. I thought about it all the time. When I was at the gym on the elliptical, I would look out the window and stare at my Honda Sonata in the parking lot. And I would think to myself, “When I look out this window in the future, I will see my brand-new Corvette Stingray.” I let myself experience how I would feel seeing my dream car out there waiting for me to finish my workout. How was I going to get it? I didn’t know. I didn’t have a plan. But I had done step one. I knew what I wanted. You want that new house? You want those straight As on your report card? You want that ripped body? Envision it. Immerse yourself in it. I went out to test drive the cars. I started to notice them more when I saw them on the street. I researched them. I surrounded myself with that vision. Start at the end and work your way back. Reverse engineer the way to your dream. So if you want that brand-new dream car, you’ve got more research to do. How much will a loan cost you monthly? How much is the insurance going to be? The maintenance? How much money do you need to save if you are going the cash route? How much more income do you have to earn? And finally, what do you have to do to put yourself in a position to bring that vision into reality? For me, I started to make moves and began to grind. I worked different angles in my business. I ramped up various aspects of my revenue streams. I went to different conferences and learned and networked and applied the things that I was learning. I had that vision. I wanted that Corvette. It was never just about owning a Corvette. I wanted that symbol, the representation of how hard I worked and that my dreams were possible. That was what obtaining this car was about. Whatever your vision, it’s not only about accomplishing it. It’s the person you become on the journey of bringing that vision into reality. So first you create the vision. Do not worry about how you are going to accomplish it at this point. Allow yourself to become a visionary. Immerse yourself in that role. If you want that dream house, start going to open houses. Get a real estate agent. Start researching. The second step is reverse engineering what it will take to own that. To become that. To get that body. See yourself becoming the architect of your life. Does that mean going to the gym five days week? Does that mean tracking your calories? Does that mean making changes in your habits and lifestyle? It’s your path to create. Opportunities present themselves every day. When you see one, you’ve got to jump on it. Dive on that opportunity when it pops up. I had an opportunity present itself. About a month and a half ago, I was looking on cars.com. I had just come back from the Tony Robbins event, and there was a vehicle that was in my price range. It had some of the features I was looking for. The red seats. And it was white. But it was three hours away. Guess what? I popped on that. I told myself, “I’m getting a hotel. I’m staying the night before, and I’m spending the next day. And I’m going to crush it. I’m making it happen. And I’m paying cash.” I’d already had the vision. I had been grinding, working my tail off in the last year. I had the money. What I did was take advantage of that opportunity when it presented itself. Never let fear get in the way of greatness or of accomplishing your journey. Let yourself be the adventurer in your story. So that’s it. These are three steps: creating a vision, reverse engineering, and taking that shot when it appears. Sure, it may have looked that way from the outside. But it was a process. I created the vision over a time period. I prepared myself to walk this journey by earning money and studying what it would take to own the car. And then I put myself in a position to take the shot when it came up. My story relates to anything you might want to acquire or accomplish. It was never about owning a nice car. A nice car is just a nice car. It’s not the car. It is who you become in the process of owning that car. Of getting that dream body, that dream house, that dream monetary amount in your bank account. Whatever the goal, along the way, you become a visionary, an architect, and an adventurer. Isn’t that how you want to live your life? That’s what it’s all about.